Tracking important events and items throughout your project is essential to a timely and successful outcome. While deadlines may be flexible, milestones are typically fixed in order to ensure you meet vital project goals on time. Project milestones may be single tasks with a scheduled deadline or your team may need to complete multiple tasks prior to each milestone, resulting in the associated milestone goal. One way to streamline planning and tracking is to use templates. The following Excel templates enable you to enter information more efficiently at review data at a glance. If you want an eye-catching, basic overview of your milestones, this template provides a striking timeline that you can present alone or as part of a report or slideshow presentation. The timeline was created using an Excel SmartArt graphic with 3-D effects and the same effect is applied to the title at the top of the page. You can customize this title with your company and project name by clicking on the shape and typing over the sample text. To add text to the timeline, click anywhere on the image and the text pane appears. You can add additional shapes by clicking on the timeline to activate the SmartArt Tools tab. Select the Design tab, click the Add Shape dropdown and choose where you want to add the new shape. In addition, you can change the appearance of the timeline by choosing another option in the SmartArt Styles group or opting for another color theme. If you wish to omit any holidays from the duration period, create a list in a single column on another area of the sheet or another sheet in the workbook. Once you have created the holiday list, click on cell B3 and click inside the closing parenthesis in the formula bar and add the cell range containing your holiday list. An example list is on the second worksheet, so you can simply customize this list and update the range. 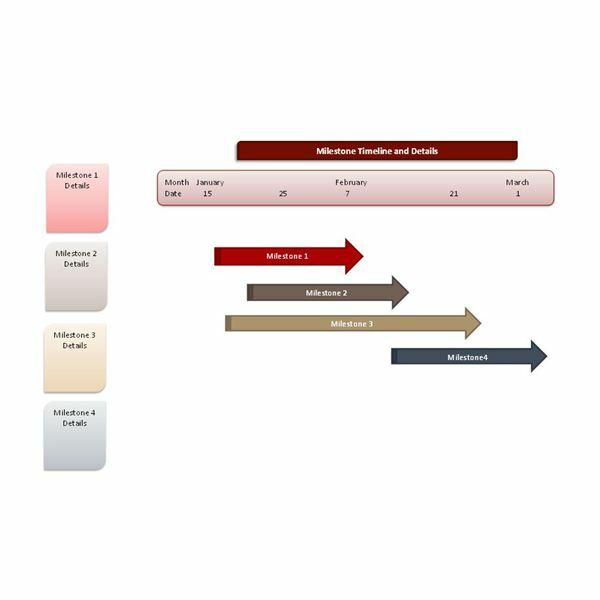 This timeline uses a bar chart to display milestone goals and dates. 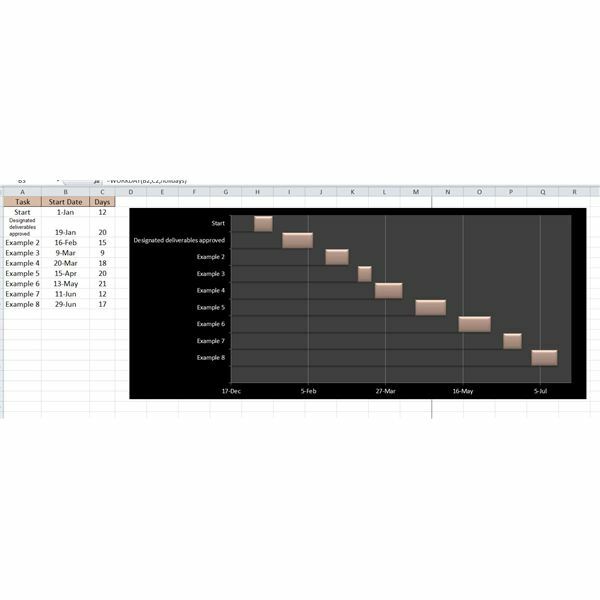 To use this worksheet, enter milestone dates into column B and milestone goals into column C. Column D contains heights, which simply alter the length of the corresponding bar on the graph. You can change these to meet your needs; negative numbers cause the bars to dip under the timeline and positive numbers boost bars upward. This simply makes it easier to read each milestone goal. 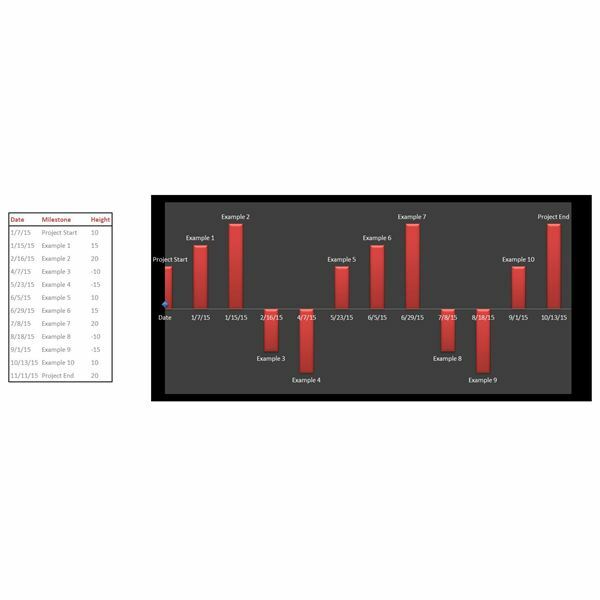 Another way to change the appearance of this chart is to choose another color theme on the Design tab in Excel 2013 or the Page Layout tab in Excel 2010. In addition, select the chart to activate the Chart Tools tab and you can make changes on the Format and Design tabs. 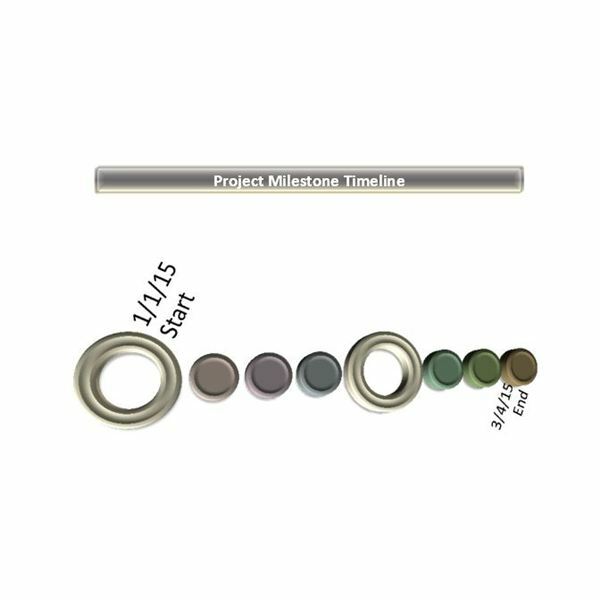 In some instances, you may wish to provide more information regarding milestone goals, such as when you are presenting a project timeline to stakeholders. This template includes room for additional details while still modeling clean lines and an uncluttered appearance. 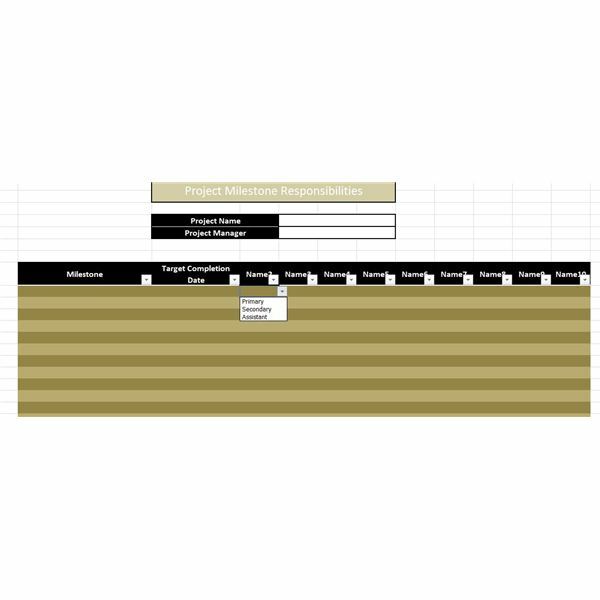 To use this timeline, enter the key dates for your milestones in the box near the top of the worksheet. Enter months into the first row and dates into the second row. Type the name or primary goal of each milestone into the arrows with the first milestone in the first arrow and so on. Enter details into the corresponding boxes to the left of the arrows. Drag each arrow to line up with the appropriate dates. It can also be helpful to track who is responsible for tasks that are required to reach milestones. This template helps simplify the process for you. Enter the names of the project and the project manager into the labeled boxes near the top of the spreadsheet. In the table, type the names of your team members into the boxes labeled “Name." Enter milestones into column C, corresponding dates into column D and select the level of responsibility for each person involved in reaching the milestone using the dropdown menus in columns E through M.
These templates can help you prioritize, monitor and follow up on milestones from the project planning stage through to completion and even beyond, as you use the spreadsheets in your closing reports and analysis.